http://hershy.smugmug.com/Travel/Ranthambhore/RT-June-2011/17444320_Qps9C3 The Sambar (Rusa unicolor) is a large deer native to southern and southeast Asia. Sambar primarily live in woodland and feed on a wide variety of vegetation, including grasses, foliage, browse, fruit, and water plants, depending on the local habitat. They also consume a great variety of shrubs and trees. They are a favourite prey item for tigers and Asiatic lions. Anecdotally, the tiger is said to mimic the call of the sambar to deceive it while hunting. They also can be taken by crocodiles, mostly the sympatric mugger crocodiles. Leopards and dholes will take young or sickly deer. Sambar have been seen congregating in large herds in protected areas such as national parks and reserves in India, Sri Lanka, and Thailand. 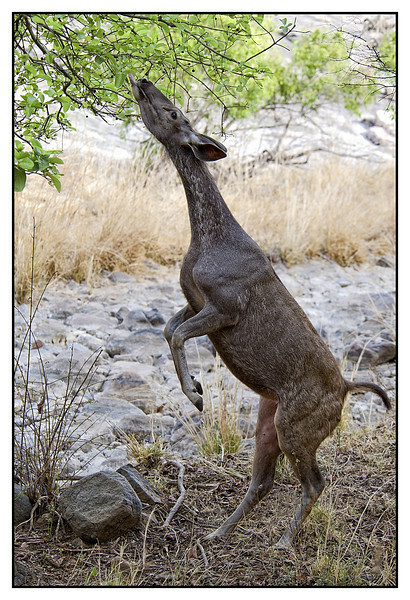 http://en.wikipedia.org/wiki/Sambar_(deer) Thank you all for your comments on diving Drongo yesterday. I love this capture of the deer reaching for food! Wow, awesome catch! Great timing!